He hasn’t touched the quiz. It’s just sitting there, kind of crumpled, languishing on the chair. Be brave. You can do it. He’s not totally slacking though: He’s been reading Jay McInerney’s Bacchus and Me: Adventures in the Wine Cellar , I book I greatly enjoyed myself. And not just because I’ve had a crush on Jay since like 1988. Well, that’s part of the reason. In fact, he is the only reason I subscribed to House and Garden; the wine column was so good. And that cute little picture of Jay that accompanied it… Damn I miss it (the column–I have a picture of him). And I told him so when I went to a book signing for The Good Life . Held up the queue a bit, but it was worth it. And I swear he winked at me. 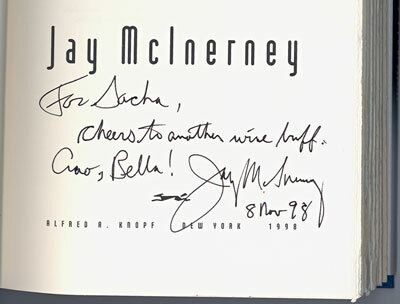 Although I don’t crush on Jay McInerney (even though he does look rogueish and brooding in that photo, I’m straight), he is one of my favorite wine writers. Everything is so fresh and has an interesting twist that is missing from some of the more pedantic folks. I flip through a Hedonist in the Cellar a couple of times a year…always seems fresh to me. I just realized this particular book in the image that he signed is for “Model Behavior.” Not a great book. But Jay was swell.